A legal expert who literally wrote the book on modern usage of the English language is adding some clarity to a project underway to convert California's complex but important political ethics rules into "plain English." Since 1974, the Political Reform Act (PRA) has regulated political ethics, campaign finance and lobbying efforts in the state of California. Over the years, the law has been subject to multiple additions and alterations that resulted in a repetitive, convoluted document that is difficult to navigate. Recognizing the need for modernization and simplification of the law, the California Fair Political Practices Commission (FPPC) began a revision process earlier this year in partnership with California Forward by the James Irvine Foundation. Recently California Forward invited the public to weigh in on a second round of Political Reform Act revisions. The latest version of the PRA includes many suggestions from the public and regulated community that were gathered during the first open comment period. The project began with review and editing at the hands of selected law students at UC Davis and UC Berkeley. It has also been through a vigorous editing process by Prof. Bryan Garner and his team at LawProse, a company dedicated to clarity in legislation and other legal writing. The public and regulated community provided their insights during the first open comment period. Then the revised PRA was sent to a firm specializing in legal writing and editing to improve its clarity and readability. "The FPCC is thrilled and grateful that Professor Bryan Garner, one of the nation’s leading legal writers and editors, and his team at LawProse, provided his expertise to complete the technical edit," said Jodi Remke, FPPC Chair. Garner has written more than two-dozen books, including the style and grammar guide Garner’s Modern American Usage, and has dedicated more than three decades to clarifying and simplifying legal language to benefit the legal profession and the public. His work with the Uniform Law Commission resulted in guidelines for legal writing that will be the benchmark for the future. 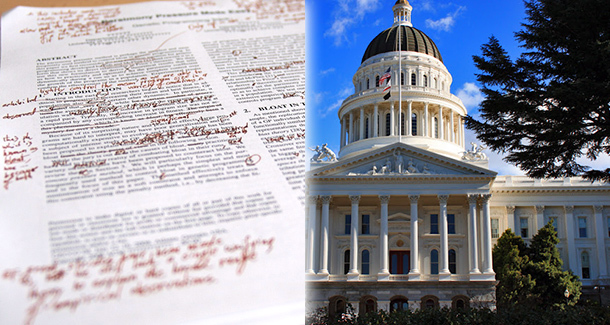 You and your team recently finished editing a revised draft of California's Political Reform Act. What approach did you take in editing the document? We streamlined it using plain-English drafting principles. That involved adding lots of headings, using vertical lists, and tightening the wordings throughout. In all, hundreds of lawyer-editor hours went into improving the Act. Your area of specialty, legal writing and editing, is relatively new. Tell us how you came to your current work. I've been writing professionally about legal language for 35 years--since entering law school. I've now written more than 15 books on the subject, including Guidelines for Drafting and Editing Legislation (2016) and Garner's Dictionary of Legal Usage (3d ed. 2011). Justice Scalia and I wrote Reading Law: The Interpretation of Legal Texts, a book about how judges interpret statutes. I like the approach the subject from both ends: that of the writer and that of the reader. What are the hallmarks of well-written legislation? How often do you think legislation meets those standards? Well-written statutes set forth rules and standards with clarity and precision. They don't contain superfluous words or wrong words. They're rare. What advice would you give to those crafting new legislation? Master the principles of both good legislative drafting and good English usage. Also, hire more editors than interns. How could the revised PRA influence law-making outside of California? It should serve as a model of good legislation in the field of political practices. Review the latest draft the PRA here and share your thoughts via email at pracomment@fppc.ca.gov or submit your comments at cafwd.org/pracomment by December 31, 2016.